In 1926, Joseph Callanan, a prominent local businessman and founder of the Werribee Traders' Association, opened a pharmacy on the south side of Watton Street. In 1937 Callanan opened a new shop on the current site, and the old weatherboard building was demolished. Local builders Rushford and Walsh constructed the existing building in 1939. Joseph Callanan's son Michael and daughter Margaret also became pharmacists and continued to run the family business. Margaret served all of her working life in the pharmacy. The pharmacy was known for continuing to supply old-fashioned medicines and for its friendly service. The Callanan family made generous contributions of medical supplies during the Truganina bushfires of 1968- 1969. The 1939 fitout is remarkably intact both internally and externally. A turnaround in chemist shop design and display occurred after the 1920's. The working area of the dispensary, with its drawers and bottles of chemicals and drugs which had been screened off from the public was opened up to public view. 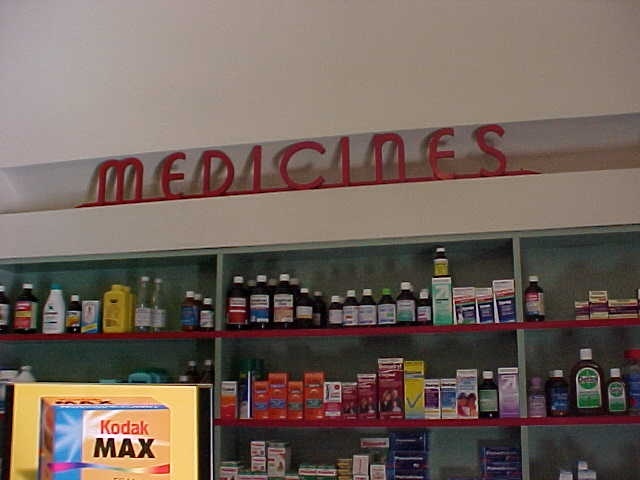 The medicines and other goods, including increasingly cosmetics, toiletries and other side-lines, were made visible with ample use of glass for display cases, shelving and counter tops. The shop front also had a major turnaround from a passive store-front to windows designed to attract customers with colour lighting and highlighted graphics. 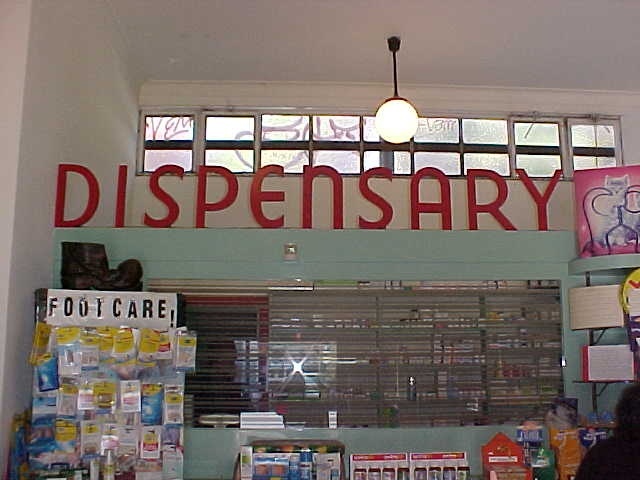 1940s promotional material by the American pharmaceutical supplier Stearns, promoted the use in shops of clean lines, light, maximum display areas, front windows revealing the entire shop and a visible dispensary. Stearns produced ideal plan configurations for pharmacy shop design which are closely reflected in the layout of the Callanan's shop. This transition in retail approach was influenced by toiletry manufacturers who agreed to sell their products solely through chemists, and in return promotion and prestige given to the products by the professionally accredited pharmacists. Ipana toothpaste was one such product which was regularly advertised in the local newspapers by Callanans. The front windows were the scene for seasonal displays (Mothers Day, Fathers Day, Easter and Christmas) and promotion of prestigious products. The interior fitout and street display is early Modernist in style with some Arte Deco influence, which meshed well with late 1930s ideals of progress through science, technology and efficient design. The interior retains its original purpose built display cases and signage. The double front doors, a low counter for baby weighing, dispensary counter, display cases, long bank of individual medicine drawers, and service counter are all designed in a coherent, streamlined fashion. The internal colour scheme is bright blue with red detailing which highlight design features. The interior signage is comprised of large freestanding red lettering in a striking modern font set in curved back alcoves to enhance the three dimensional effect. The two window display cases on the exterior are surrounded by cream and black glazed tiles. The exterior signage follows a streamlined graphic style comparable with international examples of in the 1930s. 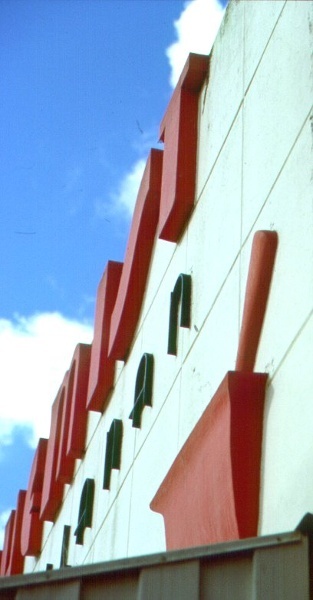 The awning is a later addition. Callanan's Chemist, Werribee is of architectural and historical significance to the State of Victoria. Callanan's Chemist is of architectural significance as a rare, highly intact 1930s modernist dispensary. The graphics used for the signage were stylish internationally in the 1920s to 1930s, andare a striking feature of this municipal chemist. It is rare to have such detail in a shop fit out in this context. 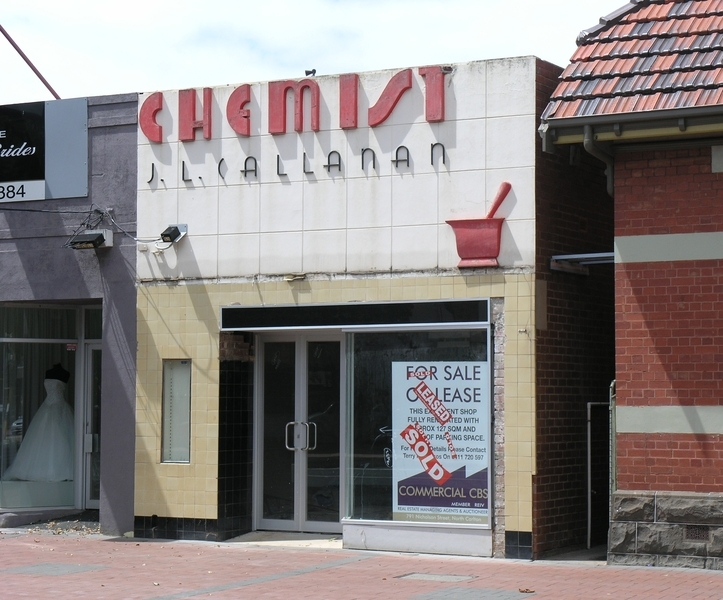 Callanan's Chemist is historically significant as a highly intact example of the building type of the chemist shop in the late 1930s and 1940s. It illustrates the transition from the enclosed and hidden dispensary, to a modern, transparent and efficient chemist shop. The design illustrates the adoption of a scientific approach and modernist principles applied to a progressive and forward thinking dispensary. 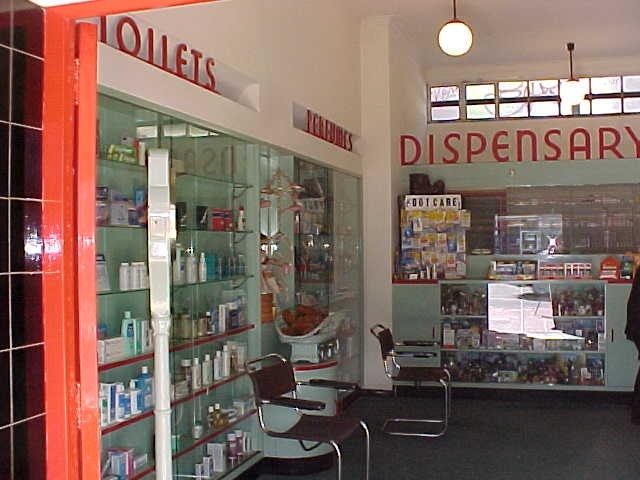 Callanan's Chemist is historically significance for its capacity to demonstrate a particular period in pharmaceutical practice in Australia and demonstrates the important relationship of the pharmacist with both pharmaceutical and toiletries manufacturers, and the public. Callanan's Chemist is of historical significance for its association with the Callanan family, which was active in the Werribee Community. The chemist shop is of historical significance as a striking modern expression in the pre-World War II central streetscape of Werribee. 1. 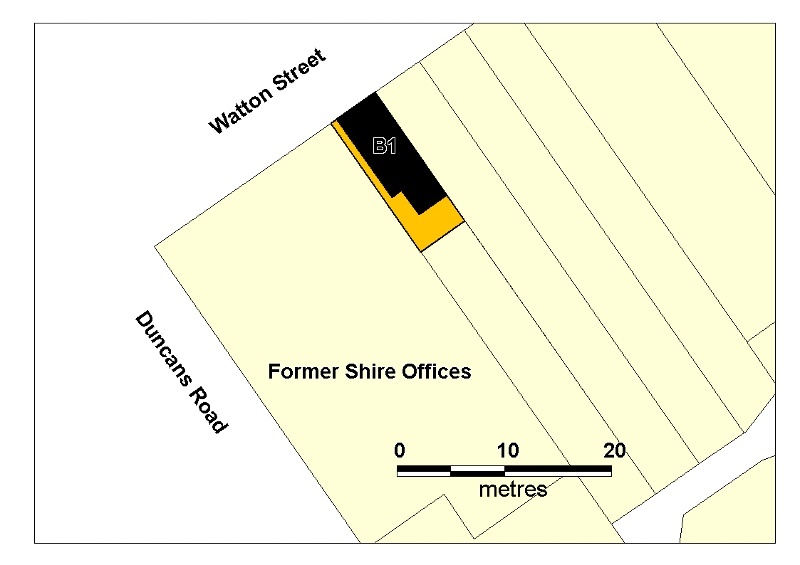 All the building known as Callanan's Chemist marked on B1 on Diagram Number 1956 held by the Executive Director. 2. All the land shown on Diagram Number 1956 held by the Executive Director. All signage and display cases. Equation of the pharmacist with the shop - role of pharmacist with the model of the small trader. In the 1920s the dispensary, with the remaining drawers, jars and bottles containing chemicals and drugs, was screened from the shop. This culminated in the 1928 Act which made separation of shop and pharmacy mandatory. However, the screen became increasingly either a decoration or a display area. The shop area was in transition, with the introduction of pre-packaged goods from the wholesaler. Permit exemptions are given below which do not affect the overall significance of the structure or historic place. The exemptions generally are for maintenance and minor works to the buildings. The purpose of the permit exemptions is to allow works that do not impact on the significance of the heritage place to occur without the need for a permit. Alterations that impact on the significant built fabric of the exterior are subject to permit applications. Of particular importance is the exterior signage and shop front. *Removal of extraneous items such as air conditioners, pipe work, ducting, wiring, antennae, aerials etc. and making good. *Installation or repair of damp-proofing. * All internal works that do not result in an alteration to the exterior.